Mississauga, Ontario - The largest Serbian Church in Canada, the cathedral church of All Serbian Saints in Mississauga, on the west side of Toronto, was too small on Sunday, April 22 to received beneath its arches all the Serbian faithful who came to greet this spiritual father, His Holiness Patriarch Irinej of Serbia. The canonical visit of the first hierarch of the Serbian Orthodox Church to the Diocese of Canada, as was expected, had it's culmination at the Sunday service in Mississauga, when the new frescoes were blessed, the work of masters Dragan Marunic and his assistants: Dragan Stankovic and Nemanja Marunic. 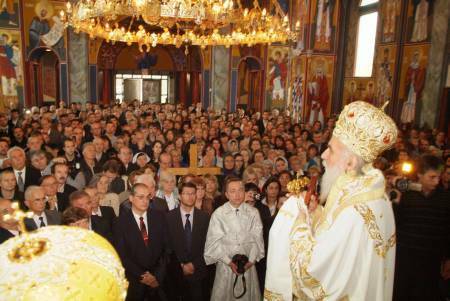 This was a gathering to remember, an assembly in which six Orthodox bishop took part. Besides the Serbian Patriarch and host hierarch, Bishop Geogije of Canada, serving were: Metropolitan Sotirios, Archbishop of the Greek Metropolis of Toronto and Exarch of All Canada; Archbishop Job, administrator of the Moscow Patriarchate in Canada; Archbishop Nathaniel from the Romanian Episcopate (OCA); and Bishop Dositej Serbian Bishop of the Diocese of Brittan-Scandinavia. Concelebrating were 22 priests from the Serbian, Russian and Greek churches, with choral responses sung by the All Serbian Saints cathedral choir. The Patriarch was visibly moved with both the number of faithful and their their expression of respect and love and from the ambo he bestowed his blessings on all, expressing his gratitude that they have endured on the path of St. Sava and built throughout Canada beautiful churches, thus building unity in their Church: "The Church sent you Bishop to this territory and everything that he has done he has done successfully. May the Lord give him the strength to continue and you will help him the most by preserving the unity for which you fought," said the Patriarch. Following the Divine Liturgy and the blessing of the frescoes, a formal banquet was served for all the guests who were, among the Orthodox hierarchs, ambassador for Serbia Zoran Veljic, General Consul for Serbia Vladimir Pavlov, ambassador for Bosna and Hercegovina Biljana Gutic-Bjelica, representatives of the federal and provincial parliament and city officials. Metropolitan Sotirios expressed his gratitude, on behalf of all the Orthodox hierarchs of Canada, that he was able to serve with the first hierarch of the Serbian Orthodox Church and pointed out the special role that the Serbian Orthodox diocese and its bishop have in strengthening the Orthodox faith in this country. The Serbian ambassador and ambassador for Bosna and Hercegovina, they were unable to conceal their pride in being a part of a people who in this manner witness their presence in Canada. Canadian politicians expressed the special significance of the Serbian community which is evidently growing in the cultural but also political life of Canada, their praise was probably best expressed by Mayor Hazel McCallion, who said that this church in the ten years since its completion has become a guidepost and landmark for all citizens of this city. True ovations were given to Dragan Marunic and his assistants, the master fresco artists. On behalf of the host, the cathedral dean V. Rev. Stavrophor Prvoslav Puric pointed out that these artists have not only with their work but also their fellowship with the faithful in Mississauga have contributed to the fact that many have become more attached to their church. Patriarch Irinej awarded Dragana Varaklic from Toronto with the Order of St. Sava in the second degree, as benefactor of this Church. She showed her generosity on this day as well when, together with her husband Goran, they donated $50,000 to the church. The canonical visit to the Diocese of Canada of His Holiness Patriarch Irinej of Serbia will continue on Monday in visiting the St. George Church in Waterloo and Holy Trinity Church in Kitchener.